As we move into a future where we want to build materials from the atoms up, we need better microscopes to see what we're doing. Right now, we can't even watch DNA building proteins in real time. We only get muddy snapshots. But that may be about to change. Over at Quanta, Natalie Wolchover has an article that will take you deep into the next generation of powerful microscopes — ones that could actually allow us to watch the movement of proteins, or see a virus in the process of attacking a cell. It all has to do with manipulating light to bounce off surfaces that are actually smaller than a lightwave. And our answers may come from "metamaterials," or special materials that are so good at bending light that they could one day be used as cloaking devices. Metamaterials have spawned numerous practical applications, including “cloaking” devices that reduce electrical interference by bending radio waves around receivers, tunable satellite antennas that can access the Internet from anywhere, and vehicle collision avoidance systems. But the Smith team’s metamaterials could not be used to create lenses that negatively refract broadband visible light. They operate at a single wavelength tied to the dimensions of the material, rather than over a spectrum of colors. And their size could not be reduced enough to resonate within the visible 400- to 700-nanometer wavelength range. A new approach was needed. “After many years of people staring at this problem of negative refraction, we’re finally getting people mastering the very, very difficult technology of making materials which have this property,” [Imperial College of London physicist John] Pendry said. Researchers have created a “flat lens” consisting of a stack of “plasmonic waveguides” that negatively refracts ultraviolet light, realizing an optical instrument first proposed in the 1960s. 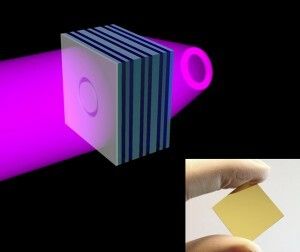 In work that Pendry calls “a technological tour de force,” researchers at the National Institute of Standards and Technology in Gaithersburg, Md., have exploited the optical properties of objects called plasmonic waveguides to create a negatively refracting flat lens like the one Veselago envisioned 45 years ago. “Our goal was to achieve it in the most classical form, as close as possible to the original presentation back in the ’60s,” said Henri Lezec, principal investigator of the project. For a range of ultraviolet wavelengths, the lens — made of a stack of silver and titanium dioxide layers — has a refractive index of -1, roughly equal and opposite to that of air. When light in this wavelength range bounces off an object and strikes the lens at any angle, interplay between oscillations of electrons in the two types of layers causes the light to bend back to the mirror-image angle as it moves through the stack, converging to form an image of the object on the far side. Because the lens is flat rather than curved like a conventional lens, there are “infinite axes and a continuum of focal planes,” Lezec explained. That means the device can create an image of everything in its vicinity simultaneously. So far, as detailed in the journal Nature in May, the team has created images of test objects such as rings and crosses, but “it could be a cell incorporating some flourophores,” Lezec said. Read the whole article over at Quanta.